My obsession with the Golden Girls is no secret to my colleagues. That timeless classic in television history featuring four women in their golden years… There’s Dorothy, the brains of the quartet, Rose, the naïve Minnesotan farm girl, Blanche, the nymphomaniac, and Sophia, Dorothy’s “little Sicilian monkey” of a mother, whose culinary conjurations are so delicious, the others eat with total euphoric abandon. The renown of Italian cooking had been so established then, the writers of the show agreed that a big part of Sophia had to revolve around Italian food. But what is it about Italian food that makes it so appealing and endearing to an international audience? It is Chef Max’s unfeigned hospitality that I find absolutely entrancing, so much so that it didn’t feel as if I am simply another customer at a restaurant, but a guest at a dinner party where I’m fortunate enough to savour traditional recipes that have been passed down for generations and subsequently improved by my host’s ingenuity with ingredients. Chef Max provides a sense of comfort and an enthusiasm for his dishes (it’s as if each and every one of them has a story attached to it!) absent in many other establishments, and it is precisely this zeal for great food and his warm, personal reception that defines Italian culinary culture for me. I begin with the Breakfast Set 3 (RM29), which seems pretty basic with scrambled eggs tossed with French beans, fresh tomatoes and spring onions, but it’s the duck sausage that takes me by surprise. Chef Max gloats a little at my inability to trace the meat’s flavour, for it lacks the distinctive aroma I usually find in duck meat. The sausage is far more fragrant and tender than what I’d normally expect from waterfowl. On top of that, chef reveals it is prepared with foie gras, which ostensibly improves the profile of the sausage. The meal also comes accompanied with two slices of toast served with ham and Fontina. Breafast Set 3What Italian feast would be complete without pizza emerging from the fiery chamber of a wood-fired oven? 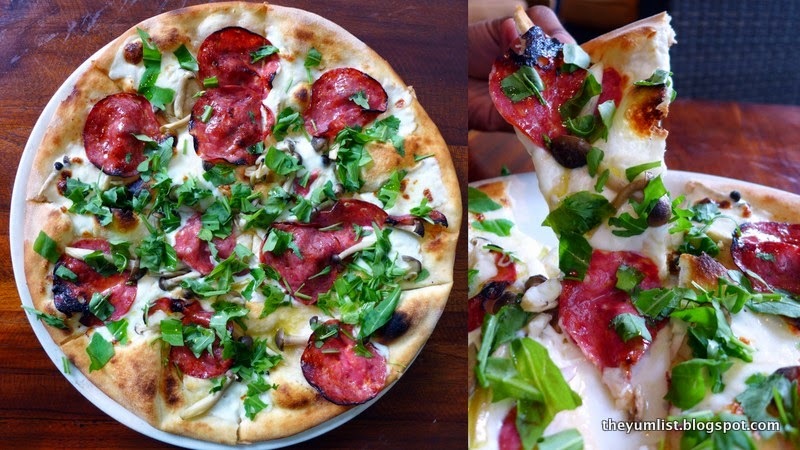 I have the incredibly decadent and visually attractive Schiacciata Allo Stracchino (RM39), which features goat salami that comes with a most amazing tang, almost citrusy even, rocket, mushrooms, and Stracchino, a voluptuous cheese that derives its name from “tired” cows herded up and down the Alps. Well the extra cardio by our bovine friends definitely paid off as the cheese is absolutely divine, oozing and spreading lusciously on the tongue. Schiacciata Allo StracchinoHaving coated my tongue with so much cheese, the Insalata Portofino (RM26) is a nice intermission with its array of sea catch prawns, smoked ocean trout, asparagus spears, julienned carrots, and assorted lettuce leaves, all dressed in a light vinaigrette. The salad here is twice the size of a regular portion due to the review, which is good news for me as I find the smoked trout lovely. The prawns are a little overseasoned for my liking, despite being a wonderful complement to the salad, but it’s fresh and has a nice firmness at each bite. The next item is a new entry in the comprehensive menu: the Spaghetti Rustic (RM29). It is by far, I daresay, one of the best spaghettis I’ve ever had. 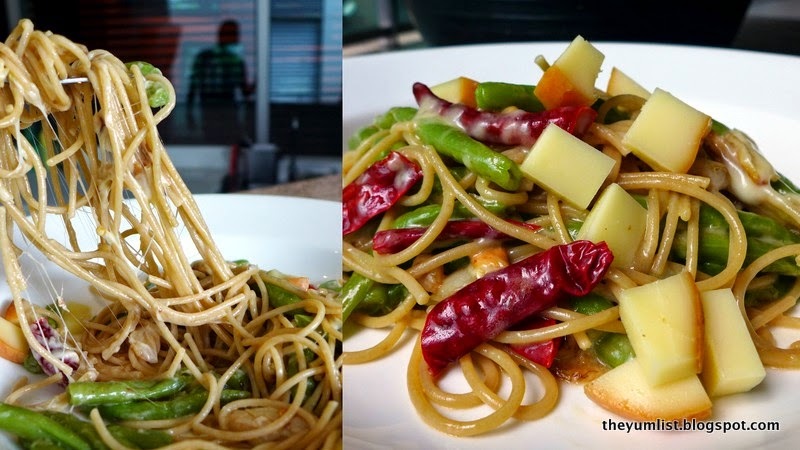 The meal begins with its arrival, marked by its conspicuous and stomach-growl-inducing smell, followed by the colourful assemblage of smoked scamorza chunks, French beans, and dried red chillies tossed in spaghetti prepared perfectly al dente. The combination is incredibly simple, yet effective, and the addition of dried chillies gives the dish a localised piquancy, which I greatly welcome. This is definitely a dish I’ll be returning to. Spaghetti RusticVineria.IT also stocks a pretty extensive wine list for an independent restaurant, and I decide to explore two different wines from disparate regions just for variety. 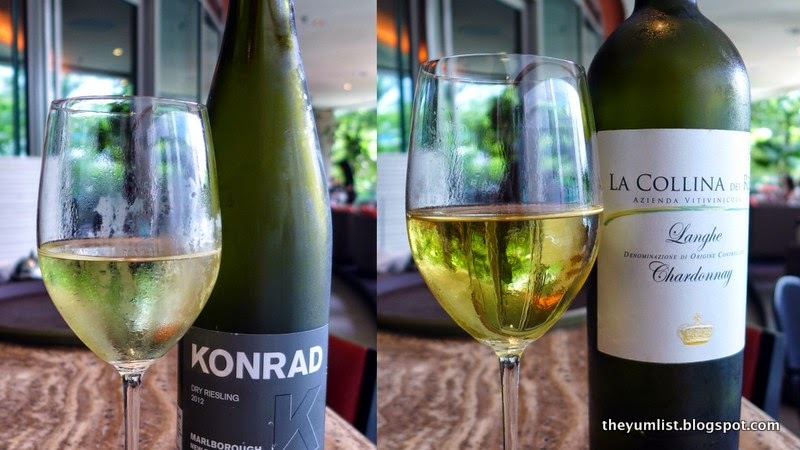 The first is a 2012 Konrad Dry Riesling (RM36 per glass) that presents itself with a lovely bouquet. The palate is supple and smooth, and is a little sweeter than expected, tickling the olfactory with the faint fragrance of apple blossoms. The Riesling appeals to me with the elegance of a prima ballerina, setting itself apart from the more vivacious bailaora, a 2006 Azienda Vitivinicola La Collina dei Re Chardonnay (RM36 per glass). The chardonnay is bolder, fruitier, and has a more pervasive bouquet than the Riesling. It’s also a little creamier, velvety, and slides gloriously down the throat, a great option with heavier fares. Wines by the GlassIn spite of our foreign escapades, my family is surprisingly timid when it comes to food we can’t pronounce, though I suppose that tradition ends with me having the Costolette Di Vitello Al Formaggio Caprino E Crema Di Melanzane (RM72). The dish comprises of four grilled lamb rib chops marinated in thyme and vinegar, topped with aubergines, goat cheese, and comes with a potato Parmigiano cake that positively melts in the mouth. The pairing of the chops with the goat cheese is titillatingly gratifying, and none of my teeth cracked from chewing sinewy tendons as the meat is completely free of them. Of course, as with great chops, the best part comes at the end when I French kiss the ribs… Molto bene! Costolette Di Vitello Al Formaggio Caprino E Crema Di MelanzaneDessert arrives daintily in the form of a Tartelette Mascarpone (RM26) crowned with Frutti Di Bosco and served with Baci Di Dama, or “Lady’s kisses” (miniature hazelnut cookies with a dollop of dark chocolate sandwiched between them). The tart is the perfect finishing touch to my meal, and the single mint leaf resting atop the medley of fresh berries brings out the flavour from the rest of the ingredients. I imagine the Baci Di Dama would go great with coffee, but is equally pleasant on its own. Baci di DamaAfter dessert, Chef Max presents a rather tame, yet incredibly fragrant drink for me to sample: Sage, Lemon and Honey Tea (RM16). The tea is redolent of an English garden, mainly because of the addition of the sage which perfumes the tea marvellously, and doesn’t irritate the esophagus with a lingering dry aftertaste. I conclude with two herbal bitters, the Amaro Montenegro (RM26) and Negroni (RM32). A little of the Amaro Montenegro goes a long way, and its bitter-sweet profile is a satisfying juxtaposition that dances on the tongue. The Negroni, available during Happy Hour (Monday to Friday; 5:00PM – 7:30PM; one caraffe of alcohol at the price of one glass), has an incredibly strong aftertaste that bombards the palate. I have to admit that I’m a neophyte when it comes to standard Italian intoxicants, glistening, displayed along shelves above counters in Italian taverns since the nineteenth century, so I wasn’t expecting the Negroni until I was at least thirty when my palate (I hope) is more developed. This isn’t a strong stuff; it’s the strong stuff. As I work through all the gin, vermouth and Campari, I find myself enjoying the drink at each subsequent sip, and have to stop myself from ordering another. NegroniVineria.IT is a dangerous place to be, especially on an empty stomach since everything seems so tantalisingly delicious. Well, once you get past the elaborate Italian names of the dishes that is; incidentally, don’t let that discourage your sense of adventure in exploring something different off the menu. The great thing about the place is that the recipes are a little unfamiliar, which I find enticing as I never really know what pleasures arrive on the plate. If ever you’re in the mood for Italian when driving around Bangsar, Vineria.IT is the place to be. Reasons to visit: Schiacciata Allo Stracchino; Spaghetti Rustic (I cannot stress enough how good this is); the Sage, Lemon and Honey Tea; the option to have your pizzas and pastas in classic or whole-wheat; the inventiveness that go into the creation of the dishes (small innovations with choice of ingredients that improves the experience).